A chorus of grief rose from the narrow backstreets of Lahore, where members of the Hussain family were saying a last goodbye to a much-loved father and grandfather. Head-scarved women wept and wailed around the body of Ashiq Hussain, which was wrapped in a white sheet and covered with rose petals. He was the latest victim of the free heart drugs that have cost more than 100 - and doctors are warning the death toll could continue to rise. 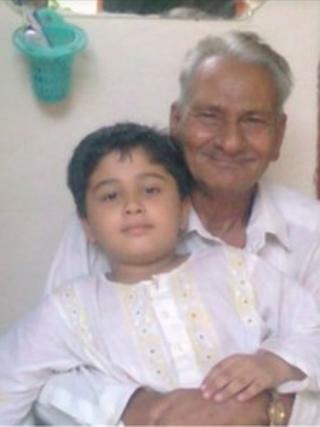 In one of the last photos ever taken of Ashiq, the white-haired pensioner was hugging his grandson, and smiling broadly. Relatives say they seldom saw him any other way. "He was smiling till the day he died," said Nazia Hussain, his granddaughter. "He was always happy and jolly. He never complained once that he was in pain, even in his final days in the hospital." Nazia travelled to Lahore from her home in Birmingham to bury her grandfather, and to seek justice for him - though she doesn't expect to get it. She fears that the three pharmaceutical company owners who have been arrested will be freed quietly in the future. "They'll get released, and you will never hear of them again," she said. "If you are rich you can do anything here." The deadly drugs were distributed by the Punjab Institute for Cardiology in Lahore. This well-regarded regional centre is Pakistan's largest heart hospital, and has been a place of healing for many. But as soon as we arrived in the grounds we were surrounded by sick patients, and bereaved relatives - people like Mukhtar Ahmad, a tall bearded man, clutching a death certificate. He told us he had been robbed of his father and great-uncle. A weary-looking patient called Abdul Rauf was still holding blister packs of the suspect tablets. "No-one contacted me about the drugs," he said. "I only stopped taking them on Tuesday, when I saw ads on TV." About 46,000 needy patients like him received the drugs in December. Within days some were bleeding profusely. Within weeks there were deaths. Initially doctors suspected dengue fever, not faulty drugs. Patients weren't warned until 11 January. The Chief Executive Officer of the Punjab Institute for Cardiology, Professor Muhammad Azhar, has been removed from his post, while investigations are carried out. Seven other officials at the hospital have been suspended. Before his removal, Professor Azhar told BBC News that an earlier response could have saved more lives, but insisted staff acted as quickly as possible. "We did not see this complication before," said Professor Azhar, a slight, wiry man wearing green surgical scrubs, and a stethoscope. "It took us 10 to 15 days to connect it to our medicine," he said. "The minute we knew, we took action. God forbid it ever happens again we will be much quicker next time." State-run hospitals like his are compelled to buy the cheapest drugs available. But Professor Azhar stressed that the suspect drugs came from regular suppliers, used for years - without incident. "This is one of the most terrible parts of my life," he said, his soft voice becoming softer still. "We were trying to help the patients," he said. "Now some have been hurt by our medicines." Across town in Jinnah hospital, we met some of the casualties. Doctors can only treat their symptoms, as they still don't know exactly what caused their illness. Shahid Nasim, a gents' tailor, was well enough to sit up in his hospital bed, but not well enough to leave it. He had a prescription for those who produced the contaminated pills. "They should hang them publicly in the squares," he said forcefully, "like they do in Saudi Arabia. The people who died left children behind. What will happen to them?" Many of the dead were the sole breadwinners for low-income families, according to Professor Javed Akram, CEO of Jinnah Hospital, who is leading a provincial government inquiry into the deaths. He says the policy of buying the cheapest drugs has to stop - a view echoed by the Pakistan Medical Association. "We shouldn't be going for the lowest price," he said, "we should be going for the safest product. The drugs were purchased at unrealistically low prices. No-one could supply quality medicine at that price." Five Pakistani drug firms are under investigation - none of them have commented on the allegations. The BBC has learned that one of the firms no longer had a licence to produce drugs. But that's no surprise, says Professor Akram, because there is nowhere to renew a licence at present. "The regulatory mechanism for drugs was a federal one," he said. "This responsibility was supposed to shift to the provinces, but they haven't established drug regulatory authorities as yet." Samples of the drugs under suspicion are being analysed at several laboratories in Europe. They may have been contaminated - deliberately or accidentally - with a metallic ingredient, according to Professor Akram. He says the drug companies aren't the only ones to blame. He points the finger at successive governments which have, he claims, starved Pakistan's ailing health service of funding. The Pakistan Medical Association (PMA) highlights another danger here - corruption. It estimates that there may be as many as 600 unregistered drug manufacturers in Punjab province - thanks to payoffs. "If you have got connections with politicians and support from the administration you can do it," said Dr Izhar Ahmad of the PMA. "A lot of money and kickbacks are involved in this business." For victims like Ashiq Hussain, there may be no justice. As his body was carried shoulder high through the streets, on a traditional woven bed, there were indications that the inquiry into the deaths may not get far. Federal and provincial authorities are working in isolation, warned Professor Akram. "There's no joint investigation," he said. "The authorities are not co-operating with each other. They are contradicting each other." And there may be risks for patients outside Pakistan. Two of the pharmaceutical firms under investigation export drugs to other Asian nations, and to Africa.